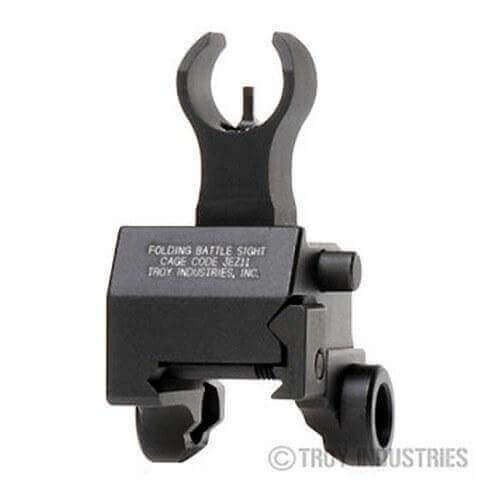 Troy HK Style Front Sight – Gas Block Height – Folding – Optional Tritium. These are rugged, reliable, combat ready Battle Sights that mount securely on the gas block. Easy to install and to deploy, with no levers or springs to fumble with, these sights position apertures at exact factory height. A stainless-steel cross-locking system ensures sights remain upright and zeroed under extreme combat conditions. A push of a button folds the sights securely out of the way until you need them again (they fold to a profile of just 0.460). Troy BattleSights feature a zero-canting attachment system for use on all military and aftermarket receivers. Built-in swivel attachment on both sides. Optionally available with Tritium, a form of hydrogen that emits its own light source, ideal for any low-light shooting situation. Tritium is a form of hydrogen used as a self-powered light source, eliminating the need for batteries or electricity. Troy Industries’ Tritium Battlesights support the shooter’s eyesight in minimal light situations. Just because the light’s not perfect doesn’t mean your shot shouldn’t be.